Where are the best playgrounds in the Washington DC area? Learn about the best slides, swings and outdoor play spaces for kids in DC, and the surrounding suburbs of Maryland and Northern Virginia. These parks are fun places for families to gather year-round. East Potomac Park - Hains Pt & Ohio Dr S (202) 554-7660. East Potomac Park is a 300+ acre peninsula located between the Washington Channel and the Potomac River. Hains Point, at the southern end of the park, is a popular picnic spot with a great view of the city and features a mini-golf course, a playground, a public outdoor pool, tennis courts, picnic facilities, and a recreation center. New equipment is set on rubber mat surfacing which accommodates strollers and wheelchairs. This beautiful park has plenty of shade, bathrooms, picnic benches and lots of areas for kids to run around. Friendship "Turtle" Park - 4500 Van Ness Street, NW (202) 282-2198. This is one of the best playgrounds in DC, with plenty of slides, swings, tunnels, and climbing structures. There is a fenced area with plenty of shade, benches and picnic tables. Other amenities include a sand box with turtles, basketball and tennis courts, softball/soccer fields and a recreation center. Kalorama Park - 19th Street & Kalorama Rd. NW. Kalorama Park is a large playground in the heart of Adams Morgan next to Kalorama Recreation Center. The playgrounds are divided into big-kid and little-kid fenced play areas. Wheaton Regional Park - 2000 Shorefield Road, Wheaton, MD (301) 946-7033. Great park with more play areas than you can imagine. Play equipment includes endless climbing structures, swings, giant slides, a sand castle and much more. Children especially like the old fashioned carousel and a train ride that goes through the park (only open in the summer). Other amenities include picnic areas, Brookside Nature Center, Brookside Gardens, a lake, ice rink, indoor/outdoor tennis courts, lighted ball fields, trails, and Wheaton Stables. Cabin John Regional Park - 7410 Tuckerman Lane, Rockville, MD (301) 299-0024. Huge park with lots of climbing structures, slides, mazes, play houses, swings, and cars. Other features include miniature train, snack bar, rest rooms, hiking trails, picnic areas, indoor/outdoor tennis courts, ice skating rink, Locust Grove Nature Center and lighted athletic fields. Plenty of shade. South Germantown Recreational Park - 18041 Central Park Circle, Boyds, MD (301) 601-4400.Newest park in Montgomery County with multiple play areas including a castle and pirate ship, a climbing wall, music area and saucer swings. Other amenities include trails, picnic tables, driving range, miniature golf, Splash Playground, indoor sports and soccerplex, and a dairy museum. Limited shade. Hadley’s Playground at Falls Road Local Park - Falls Road, Potomac, MD. Themed play areas include a castle, fort, pirate ship, and two-lane road, all of which include ramps and other features to accommodate wheelchairs and strollers. Plenty of open space for kids to run, play ball or ride bikes. Limited shade. Huge park that has recently been renovated. There are separate big kid and little kid play areas, tennis courts, basketball courts, playing fields, bathrooms, pavilions and shade. The park is located next to Meadowbrook Stables so kids can walk around and look at the horses. Beautiful park with a huge playground made with recycled tires. Kids love the zip line, ‘Bouncy Spider Hammock,’ and the ‘Dragon’ Lots of climbing equipment. Park has a lake, boating, fishing, hiking tails, a disc golf course, pavilions, bathrooms and lots of shade. Park with playgrounds, picnic areas, hiking and biking trails, Watkins Nature Center, the Chesapeake Carousel, Old Maryland Farm, the Watkins Regional Park miniature train, Watkins Miniature Golf Course, softball, football and soccer fields, basketball courts, indoor and outdoor tennis courts, and 34 campsites. Ashburn Park - 43546 Partlow Road, Ashburn, VA. 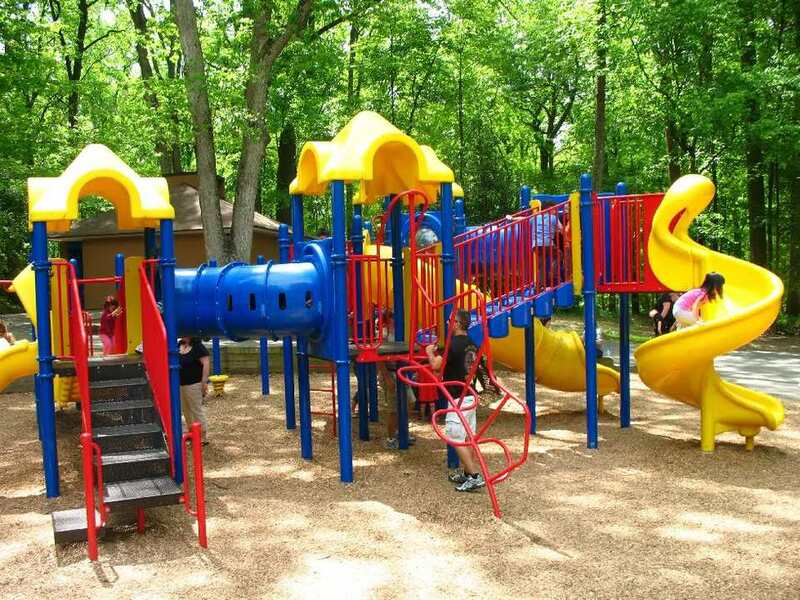 Located in Loudoun County, the 16-acre park has four separate playgrounds for different ages. Plenty of shade. Burke Lake Park - 7315 Ox Road, Fairfax Station, VA. Beautiful park with newly renovated playgrounds, a train, carousel, ice cream parlor, nature trails, a lake, fishing, boating, and soccer fields. Clemyjontri Park - 317 Georgetown Pike, McLean, VA. This accessible playground is a place for all children to play side by side with accommodations for children who use wheelchairs, walkers or braces, or who have sensory or developmental disabilities. There's even a carousel and trackless train in this two-acre playground with four outdoor "rooms." Great Falls Grange Playground - 9818 Georgetown Pike, Great Falls, VA (703)938-8835. Modern playground with rock climbing walls, tire swings, merry-go-round, and a cave with dinosaur fossils. Plenty of shade, benches, pavilions and picnic tables. Algonkian Regional Park - 20280 Cascades Parkway, Sterling, VA (703) 444-1459. One of the biggest playgrounds in the area with swings, tunnels, bouncing bridges, slides, and ladders. New equipment, plenty of shade, and lots of picnic tables and benches. Woodmont Park - 2422 N. Fillmore Street, Arlington, VA (703) 228-6525. Woodmont Park has new play equipment and nearby facilities for a wide range of ages. Play area includes play houses, rocking whale, slides, a rope bridge and monkey bars. Other facilities include benches, pavilion, basketball court, and a baseball field.